Sometimes it's tough to keep it classy with modern technology, but this Beige Lace Cell Phone Bag with Chain makes it really easy! It will hold your phone and cards no problem, and you don't have to break your theme of 18th century British aristocrat. Bravo! Night out on the town? Don't forget your classy clutch! This Black Braided Chiffon Bag with Long Chain can be used as a purse of clutch. It's perfect for a black tie affair! Have a lot of candy and no where to put it? We have the perfect place to stash your goodies. This Boo Boo Drawstring Backpack looks great with any costume! There's something about a hot pink. It shows off your super feminine side. Plus, it doesn't get any more girly than a hot pink sequin purse. The sequins while shake and shimmy while you dance. You can use this purse while you are out on the town with your girlfriends or use it to enhance your flapper costume. The ladies agree that this purse will keep your valuables under wraps while adding something extra to your costume or ensemble! Camo is in, and what better way to accessorize your wedding or prom than with a little backwoods charm? 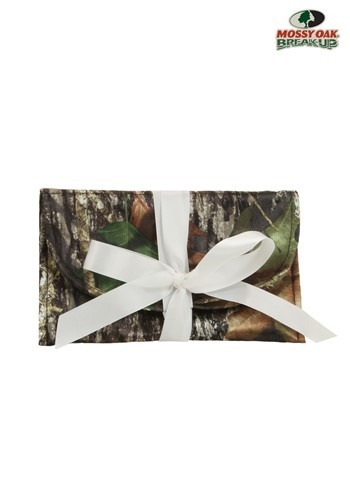 This authentic Mossy Oak clutch purse is the perfect handbag for you or your entire wedding party. Coordinate it with our complete line of accessories, or to accent his tuxedo. This officially licensed accessory is the perfect way to stand out on your big day! Car keys. Cell phone. Lipstick. Wallet. That's just the short list of all the items you can fit in this Silver Sequin Mini Hobo Bag. When you use this handy bag, you'll sparkle like the disco ball that hangs up above. This is basically a princess purse. This chiffon bag will make you feel like a princess while you hold it. It is perfect for a glamourous evening because its the perfect size purse to hold your lipstick, keys, money, and phone! This White Sequin Mini Hobo Bag has a glimmering look that you can pair with your flapper costume.The iridescent sequins are glitzy and will look great with any costume that sparkles. You can use it to hold your valuables while you dance the night away.